Can Scotland's coaches embrace a new way of signing players? Rob Marrs takes a look at how a modern, more open-minded approach to data analysis can benefit Scottish clubs in the transfer market. Scotland has a long and proud history of producing the best managers in the game, something which continues today. Sir Alex Ferguson, David Moyes, Alex McLeish, Owen Coyle, Paul Lambert, Billy Davies, Walter Smith, and even maybe John Collins if he ever puts the managerial jacket on again, are all involved at or near the top of the game. 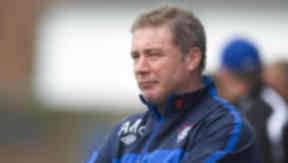 But can Scotland's next generation of coaches lead the way in the footballing world? Colin Calderwood, Derek McInnes, Danny Lennon, Billy Reid and, one day soon, Ally McCoist have a huge opportunity. In a time where not spending their precious transfer kitty on a dud is more essential than ever, our managers must start to go beyond the traditional scouting methods and apply science. At present, managers use gut instinct, experience and close counsel to identify fresh talent. At the top, that can extend to a scouting network, although Celtic appear to be the only club in the SPL at present with the finance to utilise such a system. So what is the answer for the Hibernians, St Johnstones, Hamiltons and, dare I say it, Rangers? Sabermetrics may be it. In a nutshell, sabermetrics is a way of using and analysing data and, often, interpreting data that is not used. Esssentially, it is a way of identifying new talent and value in the market. It is the victory of the geek with the laptop over the gum-chewing, weather-beaten old crow with a feeling in his gut and a fly word with his chief scout. The practice originally comes from baseball and is now better known in the game as Moneyball, with the effects of applying sabermetrics to the sport detailed in the book Moneyball: The Art of Winning an Unfair Game. Before, non-traditional data in baseball was looking at ''on base percentage'', rather than the batting average. ''On base percentage'' is a statistic that takes account of not just a batter's ability to hit the ball, but also his ability to make the pitcher miss the strike zone four times, thereby allowing the batter to walk to first base. That may not be as cool as hitting the ball, not as eye-catching as the beautiful connection between bat and ball, but one that equalled exactly the same result. Recently, Beane has been working with Professor Bill Gerrard of Leeds University on how to apply this to football. Can it happen in football? Of course, it can. Nay-sayers will say that baseball is easily broken down into events whilst football is more fluid game. It isn't so stop-start. This makes it more difficult to work out who is responsible for what. Other problems do persist - the lack of data in certain leagues, for example, with little complex data for Division One, Two and Three games in Scotland available. There are a number of other problems. As above, technology is part of it. Technology may exist at the elite level but it might not exist elsewhere. On top of that, there are cultural issues with the use of such technology. One cannot imagine certain managers in the game being told why he should sign a player with a snotty-nosed, spotty graduate with no hard yards in the game. Further, even where a manager is enlightened enough to consider sabermetrics and has the technology to do so, there is no guarantee that the data will be analysed correctly. As Beane puts it, “by using a disciplined statistical process to influence the selection of players who will bring the most value - then you are giving yourself the best chance of success. Who would not want to do that?”. Indeed, who wouldn't? So what ''other data'' should football managers be looking at? We've always looked at goals, assists and clean sheets. Should we be looking at other things? The answer is yes. Firstly, the number of touches a player takes. This reveals a number of things, such as the player's fitness level, the number of times he gets into a position to receive a ball and his team-mates willingness to pass to him. Secondly, shot creation, the number of times a player participates in a possession leading to a shot. This is subtly different from an assist, as you'll note. Evaluating assists alone is unfair to a midfielder who is playing with sub-standard strikers. If a player is creating lots of shots, that's a good thing for his team-mates and team. He is creating more scoring opportunities. Then there is ball retention, the contribution of players who are less directly involved in attack. Possession is increasingly 9/10ths of the footballing law. Increasingly, possession stats are important. A player with 80 per cent plus, or, indeed, 90 per cent plus successful passes is going to be a very useful member of any team. We massively undervalue such players. Those who boo Jon Obi Mikel, Denilson and Lucas in the English Premier League know little about the modern game. Another area that should be looked at in a player's performance is the amount of balls won per 90 minutes. Defensive stats have always been much more difficult to quantify than attacking ones. Good defenders exist in leaky defences. Clean sheets are an ineffective measure. Looking at how often balls are won instead shows a number of things. Firstly, it shows offensive players' willingness to defend, a hugely important element of forward play. Secondly, it shows defenders' and defensive midfielders' ability to tackle, intercept passes and, to an extent, position themselves well. Lastly, the perhaps more understood area thanks to the use of heat maps is ground covered. The more ground a player covers, particularly if it can be ''heat-spotted'', shows how fit a player is. Players that cover more ground are working harder for the team. If that is allied with the statistics above we can define whether a player is a hard worker who makes a proper contribution, or a busy fool. It should also be noted that this may lead to teams not signing a player. If a player scores at a decent rate but doesn't add anything else to the team, this should show up in the data analysis. This might be known as the Kris Boyd conundrum. If the statistics don't add up, even if the gut feeling kicks in, buyer beware. One of the pioneers of sabermetrics is a company called Match Analysis. You'll notice that none of their clients are Scottish. There are other companies that undertake such work but I'd guess that sabermetrics have not made their way into Scottish football. This is odd. The lack of innovation is surprising, especially as the potential savings could be enormous. The Old Firm could benefit, with Rangers cash-strapped and Celtic unable to spend the way they used to. The other clubs in the SPL could certainly benefit, with most of the other teams much of a muchness. Any team that could get players that the market that doesn't value, get the best out of them and sell them for a profit could arguably lead to a team breaking a weakening Old Firm. Further down the ladder, this could be used in youth football by clubs - it isn't beyond the wit of man - , in reserve team football, if it ever comes back to existence, for players on loan to other clubs, for players currently playing for the team or for players that a team wishes to loan or buy. So can Scotland, and Scotland's coaches, embrace a new way of signing players? It may not be as glamorous as the traditional route. It may even look a little like cheating - focusing on stats, reams of numbers and data analysis rather than watching a player, getting a feel for a player and having a gut feeling. It is, however, the future. Rob Marrs, as well as being STV Sport's newest contributor, also runs his own football blog, which covers a wide-range of matters from Scottish Football and beyond. Visit the excellent Left Back in the Changing Room for more of his work.